With the holiday season upon us my brain & stomach automatically seek out baked goods! That can spell trouble for a clean eater. But I am doing my best to seek out clean baked goods, or clean up old classics, testing them out & then passing the successful recipes on to you! 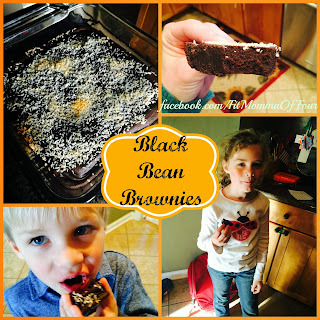 Our first baked good adventure was Black Bean Brownies. As you can see, they are kid tested & Fit Momma approved. Try out this recipe, share it with friends & family & let me know if they can figure out the "secret ingredient." Annie's guess for the secret ingredient was LOVE! Awwww...isn't she sweet?!? *Optional: unsweetened coconut flakes, sliced raw almonds, or 2 Tbls. dark chocolate chips to sprinkle on top. Directions: Rinse the beans WELL! Put all ingredients into the blender & blend for approx. 2 mins. Pour batter into a greased 8x8 pan. If desired, top with coconut, almonds, or dark chocolate chips. Bake at 350 for 35-40 minutes. Click here to check out more clean eating recipes!